We have been actively trading in Turquoise Jewelry, Native American Jewelry and Southwest Jewelry of all types for almost 40 years. As Southwestern Jewelry and Turquoise Jewelry has been the mainstay of our Trading Post throughout the years it is the focus of what we offer online. It is our pleasure to offer you Gold and Silver Jewelry of extraordinary quality. You can be assured that you will get only the best from Durango Silver Company - Guaranteed! 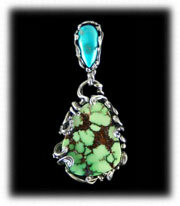 Authentic, high quality American Turquoise is our specialty. We mine it, cut it and set it in uniquely designed pieces of gold and silver jewelry. More Turquoise Jewelry Info. Durango Silver Company has been actively trading in Turquoise Jewelry, Native American Jewelry and Silver Jewelry of all types for generations. Whether it be Top Quality Handmade Native American or Silver and Turquoise Jewelry made by artisans of other ethnicity. it is our pleasure to offer you Handmade Silver Jewelry of extraordinary quality. You will find all gemstone, silver and turquoise jewelry in all designs made with almost every technique known to modern jewelers. Did you know, Turquoise is one of the first gemstones known to man? Adornment featuring the sky stone dates back prior to 5,500 B.C., & King Tut's tomb is encrusted in Persian Turquoise! Learn More About Ancient Turquoise History by clicking on the words. Silver smithing and the advent of Silver and Turquoise Jewelry started in the American southwest about 1880. Artisan Handmade Jewelry has played an important role in the culture of the Southwest since. Souhwestern jewelry is made by many artists from all different ethnic backgrounds. Durango Silver Co specializes in Turquoise Jewelry made in house and Native American Jewelry by Southwestern tribal members. Each piece of Southwest artisan and Native American Turquoise Jewelry is unique and is made by skilled American Artisans which makes it very recognizable. We meet and have a relationship with each of our American Indian Jewelry artisans.The mystique and beauty of Southwestern Silver Turquoise Jewelry has made it sought after throughout the world. We represent many styles of silver and Turquoise Jewelry that range from traditional to very contemporary in design. The Navajo, Zuni, Santo Domingo and Hopi American Indians as well as contemporary artisans of all ethnic backgrounds from the Southwest produce a wide array of Southwest Silver and Turquoise Jewelry of distinctive design. Durango Silver Company features Native American handmade Southwestern Jewelry and genuine Turquoise Jewelry of unquestionable quality. We do not focus on low price, we focus on high quality. 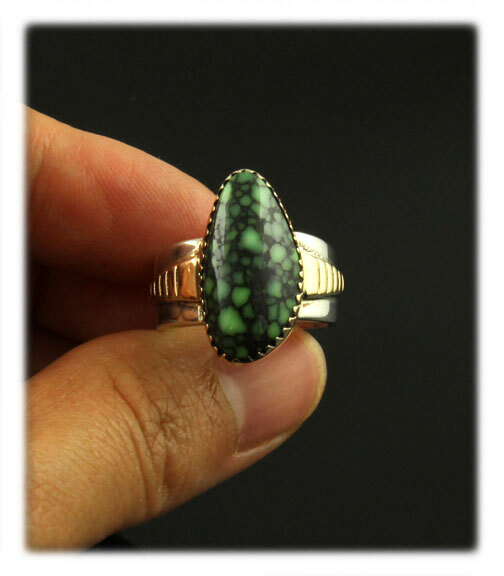 We sell Native American Turquoise Rings, Turquoise Pendants, Turquoise Necklaces, Turquoise Bracelets, Turquoise Earrings and a wide selection of other fine adornment. Turquoise jewelry has been worn for thousands of years by people throughout the world. Global museum records show the "Sky Stone" has been used for its Metaphysical and Spiritual values as far back as 5,500 B.C. It has endured the test of time and the appeal of Turquoise Jewelry has become recognized globally. We encourage you to read more on the values of Turquoise for Spiritual, Metaphysical and Fashion. We have studied this fascinating gemstone and have a wealth of information for your reading if you are interested. Follow the organized links within our web pages to find our what an interesting past Turquoise and Turquoise Jewelry has had. You can also find creditable information on jewelry design, quality and authenticity of adornment, Turquoise types & colors by region, how Southwest Jewelry is made and the value of Turquoise by clicking the link: Jewelry Learning Center. We specialize in Mens Turquoise Rings as well as Womens Turquoise Rings by size - shop our store to find a Turquoise ring in your rings size. Generally, Native American Indian Jewelry is made by American Indian Tribal Artisans from the Southwestern United States. 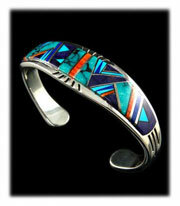 Navajo Indian Jewelry is made with emphasis on the tooling of the silver accented by Turquoise and other gemstones. Zuni Indian Jewelry is made with the emphasis on lapidary and/or stonework, they are famous for Pettipoint, Needlepoint and inlay or inlaid Turquoise Jewelry or multi-colored stone Southwestern Jewelry. Hopi Native American Indian Jewelry is known for intricate cutout overlay silverwork. Durango Silver Company represents the best of Navajo Jewelry, Hopi and Zuni Native American Jewelry. We pride ourselves in carrying high end Native American Jewelry rather then the mass produced items others carry to meet a price point. We invite you to shop for authentic Native American Indian Jewelry in our store. Durango Silver Company is one of the largest and oldest online retailers of Native American jewelry and Turquoise Jewelry. We feature one of kind items such as Native American Earrings, Native American Bracelets, Pendants, Native American Rings, and much more. We are proud to offer our customers the very best in quality American Indian jewelry and contemporary artisan Silver Jewelry. Along with Native American Jewelry, we have collected Turquoise Beads since 1972. We make great beaded necklaces using American Turquoise Beads that we have collected for over 40 years. Learn more about Bead Jewelry. Beads and Turquoise Bead Jewelry have been very popular for several hundred years in Southwestern America and thousands of years worldwide. In the Southwest it was the Santo Domingo Native American Indians who made Turquoise Beads popular in the last 100 years. Today, Turquoise Bead Necklaces and Turquoise Bead Jewelry in general is still very popular. Durango Silver Company strives to use high quality Turquoise Beads in the Turquoise Bead Necklaces, Turquoise Bead Bracelets and Turquoise Bead Earrings that we make. Our Turquoise Bead designs are unique to others as we use top quality materials and each Beaded Jewelry item is a one-of-a-kind. Turquoise Beads are one of the most popular forms of Turquoise Jewelry and we are proud to offer you the best. Our Turquoise Jewelry is made with Sterling Silver or 14k gold. Your satisfaction is important to us and your business is greatly appreciated. You have a 100% Satisfaction Guarantee when you shop our online Silver Gallery for Turquoise Jewelry or gemstone silver jewelry.